In 2009, the Brazilian government created the Dengue Network, a research system that aims to provide support for, as well as strengthen, the national effort with respect to the science, technology and innovation for the prevention, control and treatment of Dengue fever. In an effort to contribute to the Brazilian government’s strategies for research and technological development, this network has mapped the scientific and technological research performed worldwide for the diagnosis, prevention and treatment of Dengue over the last decade. The most important institutions and researchers working in this area have also been identified. Dengue fever is an acute febrile infectious disease, which can be benign or severe. The Dengue virus is an arbovirus of the genus Flavivirus, with four strains, or serotypes, which complicates the acquisition of therapeutic targets for the molecular diagnosis, prevention and treatment of this disease. Its transmission vectors are primarily mosquitoes of the genus Aedes. The worldwide incidence of dengue has increased in recent decades. According to the World Health Organization, approximately 80—100 million cases occur annually. Because there is no vaccine or specific antiviral drug to treat this disease, control efforts are restricted to vector containment. All data were obtained from the Web of Knowledge – Institute for Scientific Information (ISI), accessed through the CAPES platform. The CAPES Periodicals Portal is a virtual library which collects and provides the best international scientific production, to educational and research institutions in Brazil. It has a collection of more than 29.000 full-text periodicals, 130 referential databases, nine bases dedicated exclusively to patent, as well as books, encyclopedias and other contents. The articles were extracted from ‘Web of Science’ – ISI. The search lexical queries were made in ‘advanced search’ using the field ‘TS’ which joins: title, summary and key words. The words diagnosis, prevention and treatment were included in the search to retrieve papers with these subjects, e.g. [TS=(Dengue or Flavivirus) and TS=(prevent* or treat* or (diag* or detect*))]. The patents were extracted from ‘Derwent Innovations Index’ – ISI. The search was made in ‘TS’, just like the articles one. But since the patent text intend to include all possibilities; the International Patent Classification (IP) was used, in order to try to recover only the referent subject. The categories were chosen based on the topic interesting e.g. A61K-039/12 – Medicinal preparations containing antigens or antibodies for Viral antigens. The final patent search was: [IP=(A61K-039/12 or A61P-031/00 or A61P-031/14 or A61P-031/12 or C12Q-001/70 or C07K-014/18 or C12N-015/40) and TS=((dengue or flavivirus) and (prevent* or treat* or (diag* or detect*)))]. The searches, articles and patents, covered the last decade. The data were treated with the text-mining software Vantage Point (http://www.thevantagepoint.com) and its appropriate ISI filters. The different names of the authors and institutions were match together using a process of standardization and Vantage Point thesauri previously created. The co-occurrence matrices of authorship data were built into Vantage Point using appropriate tools and macros. 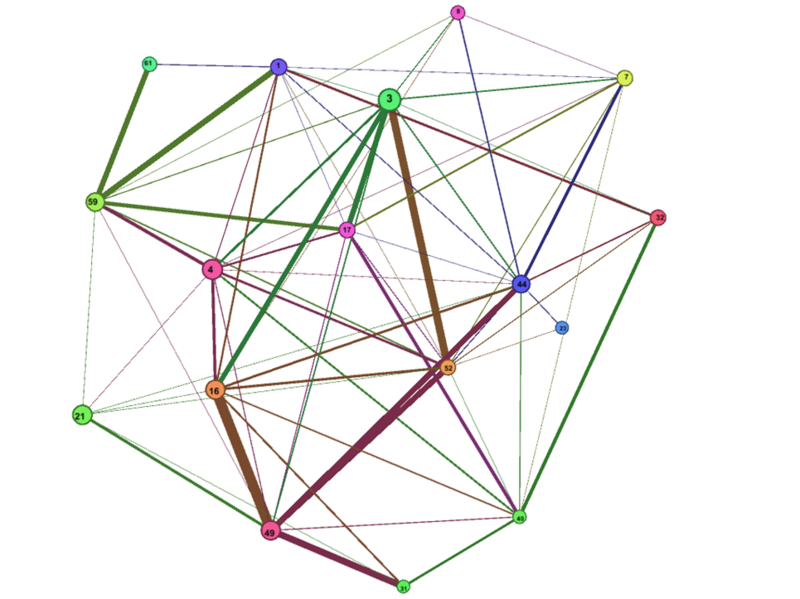 These matrices were exported to the software Gephi (http://gephi.org) to analysis the collaboration networks. The data were treated and the layout was chosen to emphasize the groups. From the 918 patents that were founded, it was selected those which had the words, on the ‘Abstract Mechanism of Action’3, related to the subject e.g. Inhibitor, vaccine, treated, detected, protect, treatment. The final number is 415 patents. After that, to construe the patent data it was used a macro that matches the International Patent Classification with the technology area. The macro was created report to the World Intellectual Property Organization (WIPO)- Concept of a Technology Classification for Country Comparisons. The social networks analysis was done focus on basic elements, which gives information to managers and allow them to make the right decision [2, 3]. For this reason it was emphasize the visual information over the statistical data. 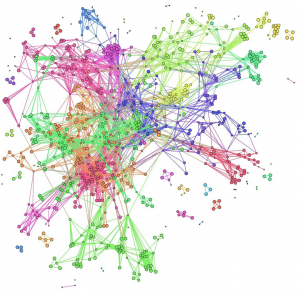 The Figure shows the co-authorship network where 934 authors, those which have more than three articles published on the last decade. We assumed that those which have less than three, publish sporadically on the present subject. It was analyzed the prior components and it was observed that Prevention and Diagnostic does have collaboration such as Component I, II and III for diagnosis and Components IV and V: prevention, vaccine. Treatment appears as a collaboration group, but in minor proportion than detection and prevention. The Component analysis provides information for strategic managements on collaborative agreements . Formal alliances have a positive impact on development performance. The patent data shows that the Pharmaceuticals, Biotechnology and Organic Chemistry appear as the main technology areas. Such as others technologies areas, the private institutions have a strong and priority participation on the analyzed patents. But the public institutions show a good collaboration, compared with other health technologies areas. From the ten first ‘Patent Assignees’, 40% are public, what represent an expressive collaboration. Other studies have been performed to comprehensively evaluate the collaboration and its impacts on health system. 2. 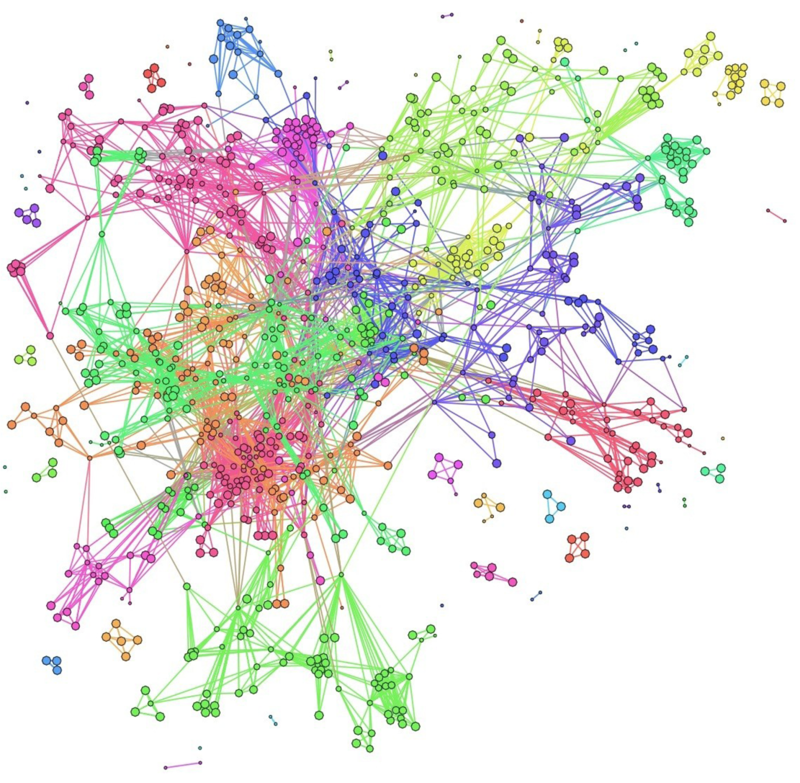 Scott J.P. Social Network Analysis: A Handbook. SAGE Publications. 2000. 3. Hawe, P.; Webster, C.; Shiell, A. 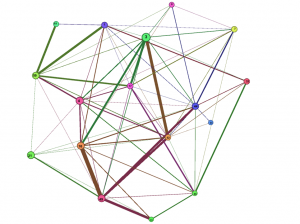 A glossary of terms for navigating the field of social network analysis. J Epidemiol Community Health 58: 971–5. 2004. 4. Morel, C. M.; Serruya, S. J.; Penna, G. O.; Guimaraes, R. Co-authorship Network Analysis: A Powerful Tool for Strategic Planning of Research, Development and Capacity Building Programs on Neglected Diseases. Plos: Neglected Tropical Disease. 2009.